In next week’s Marine Corps Times, we’ll have a package of stories highlighting what’s coming this summer for Marines in Afghanistan. 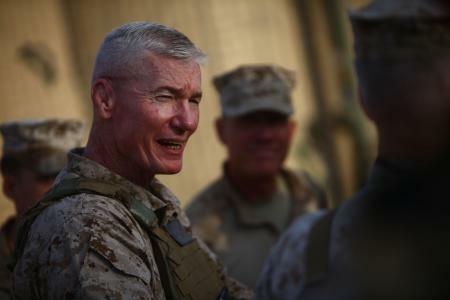 Much of it comes from an interview I did Friday with Maj. Gen. John Toolan, the top commander in Helmand and Nimroz provinces, where 17,000 Marines are deployed. We covered a lot of ground, some of which appeared in this breaking news story last week. Then I asked the general if there was anything else he wanted to touch on. Not surprisingly, he said he was proud of the troops under his command. But he also added a candid assessment of what it’s like to be training members of the Afghan national security forces, even after dozens of them have killed U.S. personnel in the last few years. The general didn’t add much else to the topic, but it’s a frank assessment of what he and his troops are dealing with. It’s also rings a lot truer than when military officials suggest there’s no pattern emerging with green-on-blue deaths. Between the riots and people turning on you it makes me really question why we are still there. It just seems to me the people are not grateful and/or understanding. I could be totally wrong since I have never been over there, but really, why do we tolerate them killing our men and women while we are trying to help them.